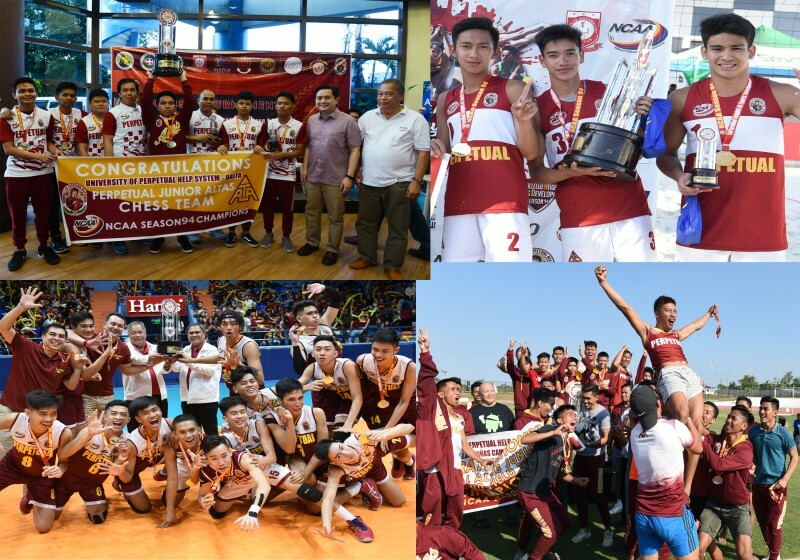 HOST School University of Perpetual Help System Dalta (UPHSD) Junior Altas topped the overall sports discipline at National Collegiate Athletic Association (NCAA) Season 94 for the 2018-2019 for their first ever General Championship since joining the oldest collegiate league in 1984. The Tony Tamayo owned school reigned in Chess, Indoor Volleyball, Beach Volleyball and Track and Field to earned the 50points each, placed 1st runner up in swimming for 40 points, 3rd runner up in table tennis and football for 30 pts each, earned 20 points in basketball and lawn tennis, 15 points in badminton and 10 points in taekwondo. Arellano Braves placed 2nd runner up in overall with 302.5 points. Awarding ceremony of the General Champions will be on March 28, 2019 during the NCAA Cheerleading Championship at Mall of Asia (MoA) Arena in Pasay City. “We congratulate the whole team and the whole of UPHSD community is proud of the accomplishments’> said NCAA Policy Board Chair and UPHSSD president Anthony Tamayo in an interview. Chris Pondoyo of Junior Altas Chess Team, Hero Austria of Indoor Volleyball, Noel Micheal Kampton of Beach volleyball and Jerick ‘Toto’ Arzaga was this Season MVPs of their sports divisions, while FIDE Master Roel Abelgas of Chess Team, Sandy Rieta of both Indoor and Outdoor Volleyballs and Trece Academia was adjudged as Coaches of the Year.